, a French miscellaneous author, was born at Hermanville, in the neighbourhood of Caen, about 1604. It is said, in the “Segraisiana,” but we know not on what foundation, that he was the natural son of Mr. Fauconnier of Caen, a treasurer of France, by a woman of low rank, whom he afterwards married. 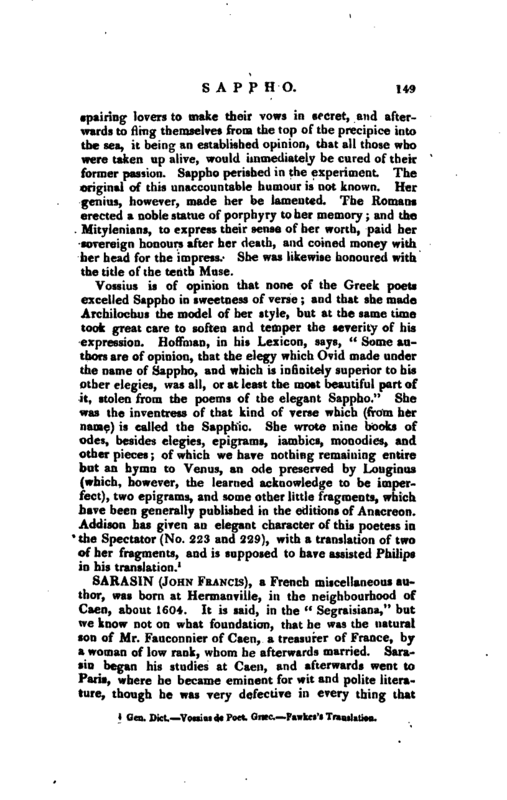 Sarasin began his studies at Caen, and afterwards went to Paris, where he became eminent for wit and polite literature, though he was very defective in every thing that | could be called learning. He then made the tour of Germany; and, upon his return to France, was appointed a kind of secretary to the prince of Conti. He was a man of a lively imagination and ready wit; and much caressed by those who thought themselves judges of that article. He was, however, so frequently invited on this account that he began to envy matter-of-fact men, from whom nothing of the kind is expected. He was also unfortunate in his marriage, his wife being a woman of a violent ungovernable temper. 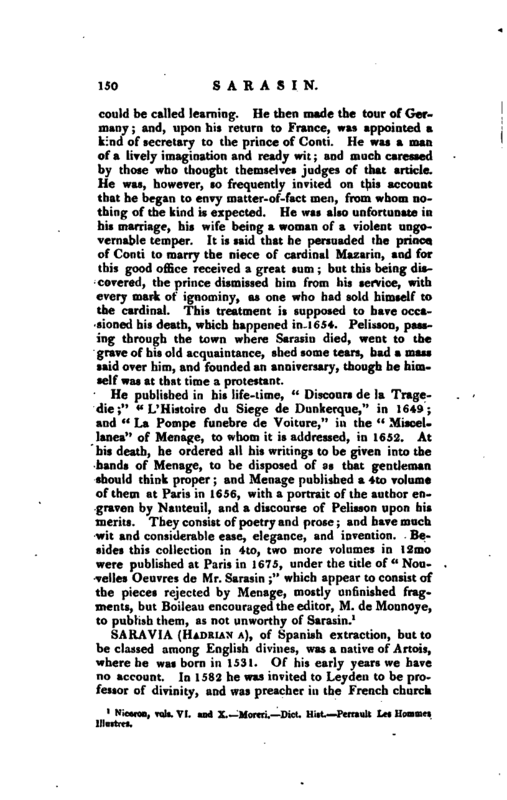 It is said that he persuaded the prince of Conti to marry the niece of cardinal Mazarin, and for this good office received a great sum; but this being discovered, the prince dismissed him from his service, with every mark of ignominy, as one who had sold himself to the cardinal. This treatment is supposed to have occasioned his death, which happened in 1654. Pelisson, passing through the town where Sarasin died, went to the grave of his old acquaintance, shed some tears, had a mass said over him, and founded an anniversary, though he himself was at that time a protestant. 1 Niceron, vo’s. VI. and X. —Moreri. —Dict. Hist. Perrault Les Homme plastics.